One thousand two hundred years after Imhotep, another architect, Senmut, went down in Egyptian history with another architectural masterpiece. Queen Hatshepsut, more a benefactress of the arts than a military leader, commissioned a monument to be built in honor of her father Thotmosis I and for herself chose an inaccessible valley which, consecrated to the goddess Hathor, welcomed the dead into the next world. Having been abandoned, in Queen Hatshepsut’s monument, they installed a Christian convent known as the “Convent of the North”, hence the area’s present name of Deir el-Bahari; it was thanks to the insertion of the convent in Pharaoh’s temple that it was preserved. The architect minister Senmut had the intuition to make the widest possible use of the dramatic range of ochre-coloured rocks spread out inside. The design of the monument was also new and Avant-grade to the extent that the temple of Hatshepsut, called Djeser or ” the most magnificent of the magnificent” by the ancient Egyptians, is unique in Egyptian architecture. The temple, which faces eastwards, was a series of vast terraces, which, by means of flights of stairs, ascended to the sanctuary. An avenue of sphinxes and obelisks provided access to the first terrace, enclosed on the far side by a portico consisting of 22 pillars and flanked by two Osiris pillars. On one of the walls, bas-reliefs narrate the birth and childhood of the queen and the expedition that the sovereign promoted in the mysterious country of Punt, perhaps what is known as Somalia nowadays, as they feature giraffes, monkeys, panther skins and ivory objects. on the far wall, 18 large and small niches were supposed to house statues of the queen, both seated and standing. this temple is characterized by its 16-corner pillars, so admired by Champollion, who called it protodoric. The entire left part of the valley, however, was occupied by the gigantic burial temple of Montu-Hotep I. 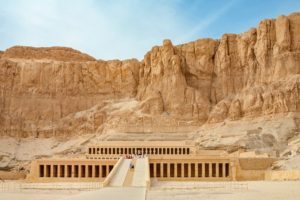 Five hundred years before Hatshepsut decided to built her temple in this valley, Pharaoh Montu-Hotep I had the same idea and built his tomb along the typical lines of the Old Empire but tending towards the tombs of the New Empire.